Raychem T2 Red with T2 Reflecta. Guarantees a uniform temperature level across the room and an extremely fast heat up and reduced heat-loss. 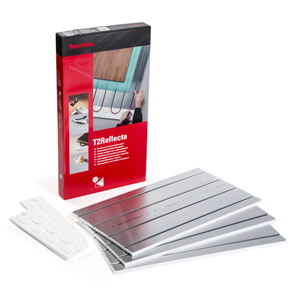 The aluminium layer and insulation of the Raychem T2 Reflecta minimises downward heat loss. Raychem T2 Reflecta provides heat faster. Automatic self-regulating output depending on environment; more output in cold zones, less output in warm zones. - insulation & integrated aluminium heat distribution layer. New construction. Good insulation:- 35W/m2 – 60W/m2. Renovation. Good insulation:- 60W/m2 – 100W/m2. Insufficient insulation. More output required:- > 100W/m2. The above values are for comfort underfloor heating. Make a heat-loss calculation if in doubt. (Insulation, room size, number of windows…) or Contact Us. The table below shows the required spacing and cable length per m2 and the spacing between the cables. The power output give approx. 20-25⁰ C.
Please click here to view further details on Raychem Underfloor heating suitability and sizings. Tile Flooring. 45. 3.3. 300. Wood/laminate/plastic floor covering/carpet. 35. 3.3. 300. Raychem T2Reflecta pack 1.0 m2. 3pcs of T2Reflecta plates (720mm x 400mm). 2pcs of end plates (100mm x 400mm) for 0.944 m2. Raychem T2Reflecta pack 3.0 m2. 10pcs of T2Reflecta plates (720mm x 400mm). 6pcs of end plates (100mm x 400mm) for 3.12 m2. Raychem T2Reflecta A-Fix. Adhesive for gluing T2Reflecta plates on the subfloor, 15kg paper bag for 6 m2. Consumption: 2.2kg/cm/m2 2.2 kg/m2 with 6mm tooth comb.). T2Reflecta Tiles. Complete pack for 10 m2. (T2Red 100m heating cable, 1 CE-Kit, 4 T2Reflecta packs = 33 T2Reflecta plates and 20 end plates, 2 adhesive A-Fix, 1 Primer P-Fix). 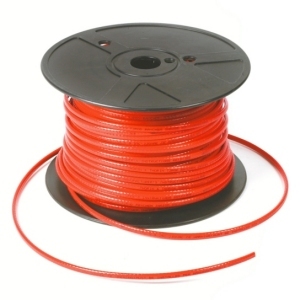 Click here to view more details on the Raychem T2 Red heater cable. Materials. Alu (0.5mm thickness/& EPS (12.5mm). Plate dimensions. 720mm X 400mm x 13mm. End plate dimensions. 100mm X 400mm x 12.5mm (no alu). Thermal expansion coefficient. 2.4 x 10(5) 1/K. Long term pressure capability. 140kPa (14000 kg/m2).